It was a pleasure to sit down with Miriama Kamo from TVNZ’s Sunday show and chat through why we started Blinder and how it’s helping the media and fans connect with athletes from the NRL to the NCAA. After receiving applications from across the U.S. and more than 20 countries, Stadia Ventures is excited to announce its Fall 2018 cohort for its sports and esports business accelerator. What do athletes think of Blinder? While Blinder’s technology is driven by communications managers, the thoughts of athletes have heavily-shaped what we’ve created. Here David Pocock, Will Genia, Reece Hodge and Michael Hooper – from the Australian national rugby team – share their thoughts on what Blinder does for them and the Qantas Wallabies. The last 12 months have kept Andy Seeley on his toes. He’s run athletics communications for the University of Central Florida (UCF), as they’ve experienced unprecedented interest in their unbeaten Knights football team. The Division 1 college went on to proclaim themselves as ‘National Champions’, which did little to settle things down. We’re proud to announce that Blinder is a finalist in the inaugural Australia and New Zealand Sports Technology Awards (ANZSTA). When he was eight, Matthew Syed’s parents bought him and his big brother a full-size table tennis table. Fortunately, the family had a garage which was big enough to fit both the Super Deluxe 1000 and the increasingly competitive boys. Having a table and a big brother were just a couple of the advantages that Matthew enjoyed on his path to becoming a British table tennis champion. PR managers in pro sport have faced a tough choice until recently. When arranging media phone interviews, they’ve either had to share the personal numbers of their athletes and coaches – without being too sure where those numbers are ending up – or they’ve had to put a whole lot of extra resource into providing access without distributing numbers. Fremantle’s media and comms manager, Luke Morfesse, shares some thoughts on handling media requests and why he uses Blinder. By Caley Wilson. © 2019 Blinder Ltd. All rights reserved. 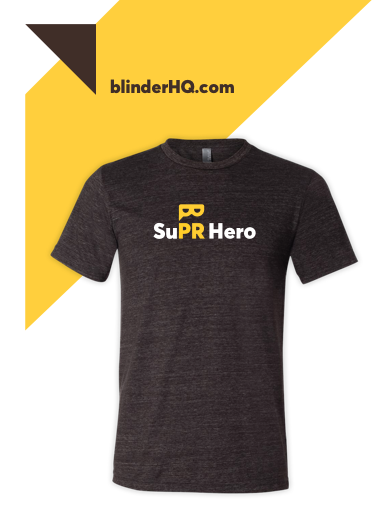 Go a step further and make your first Blinder call during the convention to receive a free SuPR Hero t-shirt! * Free trial extended until 14 August, 2018. ** If you or your college sign up for an annual plan with two or more users. Join us 3pm Friday for our product theatre showcase in Woodrow Wilson Hall.